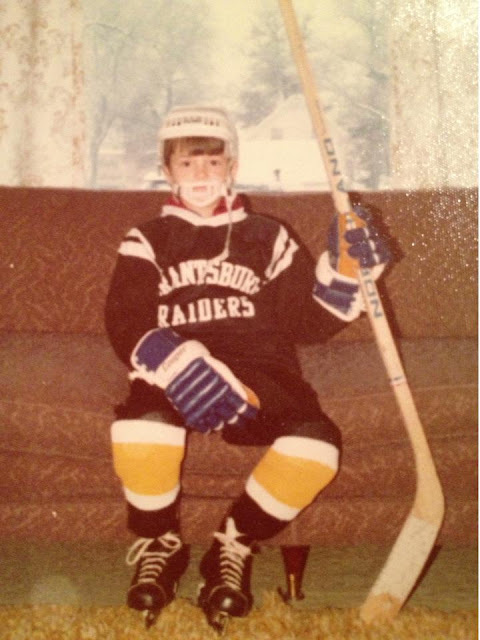 My Uncle, one of the first kids to play organized hockey in my town. Picture from 1975. One of the biggest influences on me has been my Uncle. He is a major reason I am the person I am, because when I was little (and still today) I wanted to be just like him. So you can thank or blame him for me being me. My uncle and I are closer in age to each other than my uncle and dad. So in this small town, a lot of people think we are brothers. In a way, it's true. I've always thought of him as my cool big brother. I've always wanted to spend time with him. My whole life he has been one of the smartest, kindest, funniest people I know. We share the same taste in music. We share the love of the outdoors and the passion for hockey. As the above picture shows, he's been involved in the sport for a long time. He was one of the first kids to play organized hockey in my small town. As the picture below shows, after playing, he coached my team and others for years. When his two daughter, who mean the world to him, started to play he coached them as well. 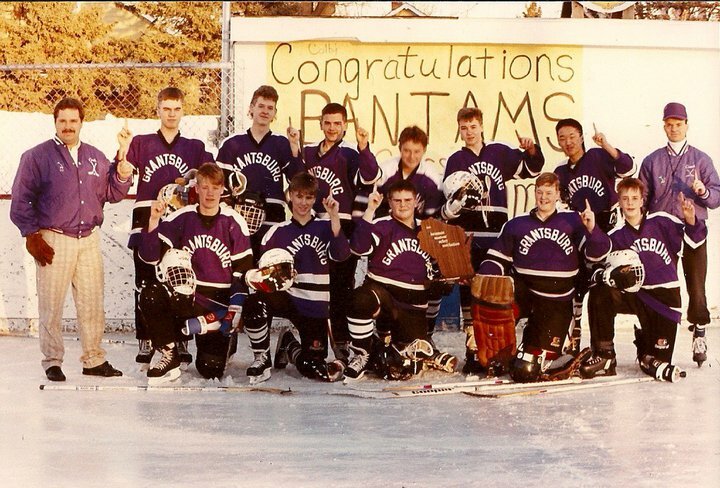 1990 WAHA Bantam Class C Champions. The Uncle on the far right. 1990, mullets and outdoor ice. Not only did he coach his daughters, he was driving force to organized an all girls program. Back when I played a handful of girls would play on the boys team. 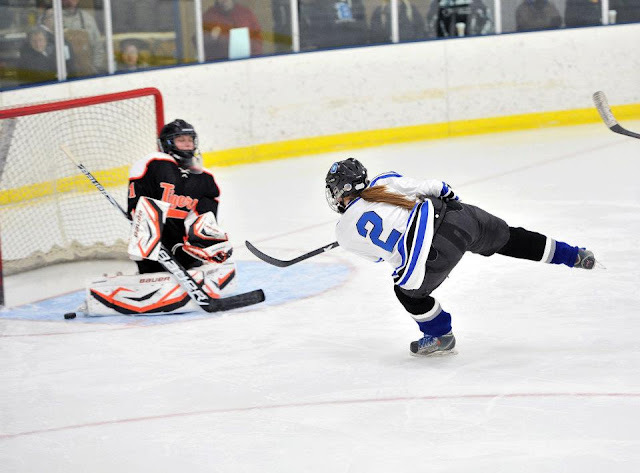 Now, largely due to my uncle, there is a whole program in the area for girls hockey. I tell you, it's really cool to watch hockey players battle it out on the ice with pony tails hanging out of the helmets. The Cousin putting the puck in the net this year. My uncle's coaching career tapered off a few years ago when he was diagnosed and started his battle with cancer. The treatments and medications made him weak and unable to handle the cold very well. But that did not side line him altogether. He still went to all the games keeping stats and gave advice and guidance to the girls. This year, as the cancer progressed, he went from wobbling slowing to the seats under his own power, to needing to be pushed in on a wheelchair. Now he's in hospice care at home. I go to the games and send him a text when someone scores and my aunt video tapes the games so he can watch them the next day. I don't need to go into the details about the fight with cancer. I'm sure plenty of you have had to deal with it in your own life with friends, loved ones, or yourself. But my uncle's fight as made me admire him all the more. Seeing him in so much pain, so weak and unable to move; and he is still smiling, still joking around. When asked how he is, the answer has always been "great!" Even when he has to have a catheter to relieve himself and is confined to a hospital bed most of the day. Or for those few minutes he has the strength to get around, he has to shuffle with a walker. He gets around like if he was 98, not 48. Today is a big day. The Cousin has a big game this afternoon. Her team is on a roll and playoffs are in their future. A win today could mean a first round bye and home ice for the second round. It's also parent's day. The game when the parents walk out on the ice with the girls and are introduced before the game. Since the Cousin is a senior, it's her last chance to walk out on the ice with your mom and dad. A dad that means the world to her (also the other way around) and is pretty much stuck at home. I say pretty much. We have a plan. A friend has got a hold of a handicap accessible van and we got permission from the hospice nurse to load my uncle up and take him to the game. For weeks now, he has been trying to build up his strength. Today we will see how it goes. We have a group getting ready to make this move happen. "<The Uncle> woke up this morning and said 'is today the day I get to go to hockey?'. I said yes and he started to cry, then said thank you! So thank you everyone for making this happen. We are lucky to have such a wonderful family and friends." I'm lucky one. I'm the one who has been blessed with such an inspiring uncle to idolize, and an amazing family that goes along with him. Plus some incredible friends I'm lucky enough to share. Today was awesome! The move to and from the rink went flawless with the help of some great friends and a fantastic volunteer driver. The lady's won their game in convincing fashion. And the Cousin had a pretty goal. It was really an emotional experience. The Uncle got to take the ice with the Cousin pushing him out in a wheelchair. In between periods the rink announcer read bios on all the seniors and their favorite memories playing hockey and who was their biggest influence in hockey. Most of the young women said the Uncle was their biggest influence. When the rink announcer read the Cousin's bio, his voice broke a few times. There wasn't too many dry eyes on the ice or in the stands either. Although nothing was mentioned about his illness, this small tight net town and surrounding area know all too well. Even some of the fans for the other team were noticeably moved. They didn't need to be a rocket scientists to figure out why there were tears, and they joined in with the cheers after the Cousin's bio was read. I would like to thank my dear friends and family who helped put this together. Especially the guy who arranged for the van and put this all together. You mentioned "it felt great to do something for a good friend today." You Sir, did more than that. You did something amazingly awesome for a whole family and group of outstanding friends, who will never forget it. Thank you so much!